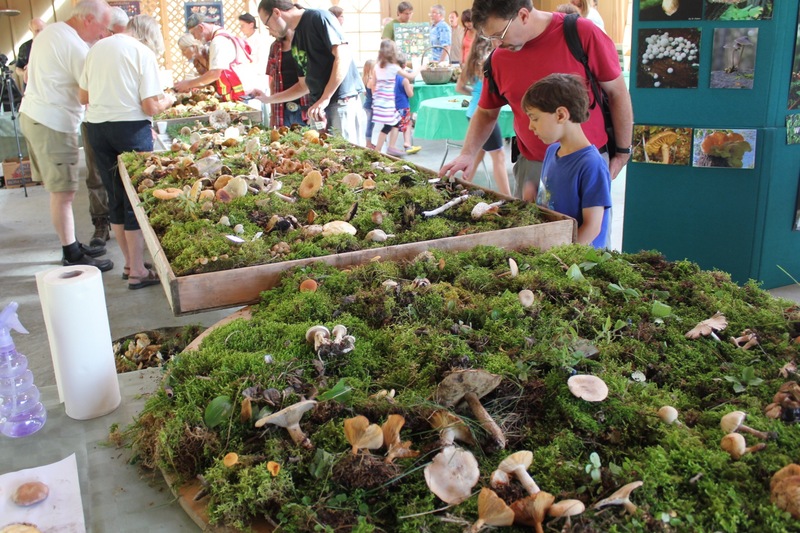 Last Sunday (August 18th), B and I and the Little One took in the Alberta Mycological Society’s (AMS) annual “City of Champignons” Mushroom Exposition at the Devonian Botanical Garden. 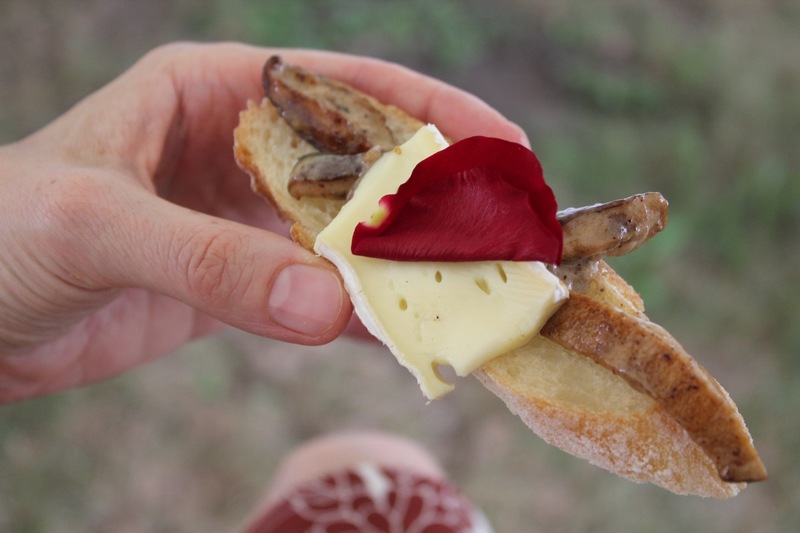 It was our first time attending this event and we were looking forward to seeing the displays, tasting some wild mushrooms and talking to local experts about our own recent forays in the backyard here at cabinorganic. We were amazed at the amount to work that went into the fresh, wild mushroom displays. 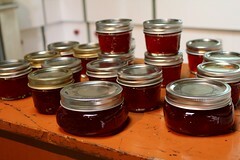 These were gathered and arranged by AMS volunteers, both the evening before and that very morning. They were arranged and labelled in family groups so it was very easy for us to find many of the mushrooms that we see daily on our twice daily walks but haven’t got around to identifying yet. The displays were also a nice opportunity for mushroom lovers like ourselves to look closely at, handle, appreciate the diversity and smell the wonderful mushroom aromas. Experts were on hand at each table to answer any questions and provide additional information. 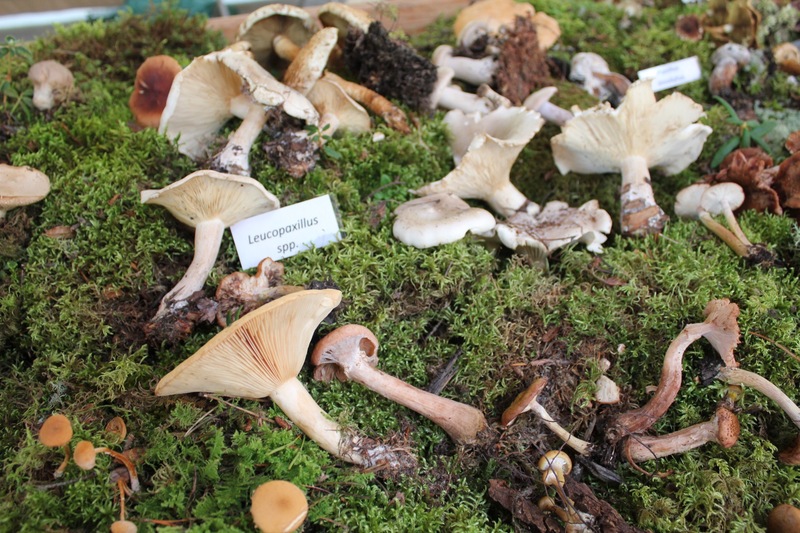 The AMS also had a few large displays featuring local mushrooms, medicinal mushrooms and poisonous mushrooms. There were also tables featuring recommended books, and field guides and posters were also available for purchase. Our favorite part of the day was the tastings! Chef Chad Moss had prepared an amazing feast for the senses, including wild lobster, honey and oyster mushrooms, which were carefully paired with smoked bacon, brie and rose petal, sea bean and other unexpected flavors. These were served on a freshly baked baguette. 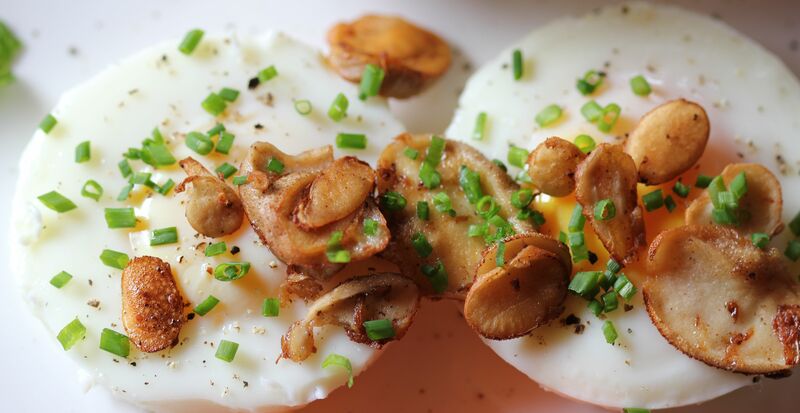 In his presentation on Fungi Flavors, Chad challenged us to let go of our dependance on recipes and be creative with our wild mushroom finds in our own kitchens. He really inspired me to let the mushroom be the central taste instead of my usual habit of masking it with garlic, onion or ginger. 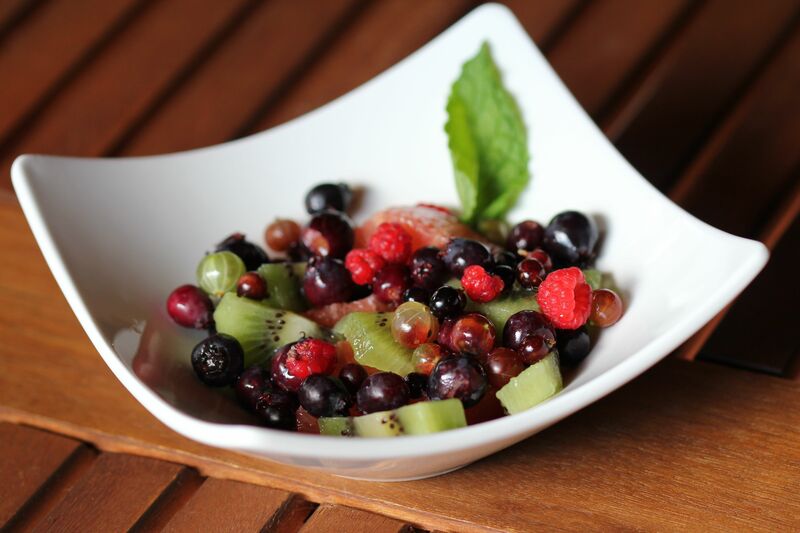 Instead, he demonstrated how more subtle flavor combinations, which may include apple cider, scotch, earl grey tea, cardamon, bacon, brie, nuts, even fresh strawberries and cream can bring out the unique earthy flavors of these meaty delights. 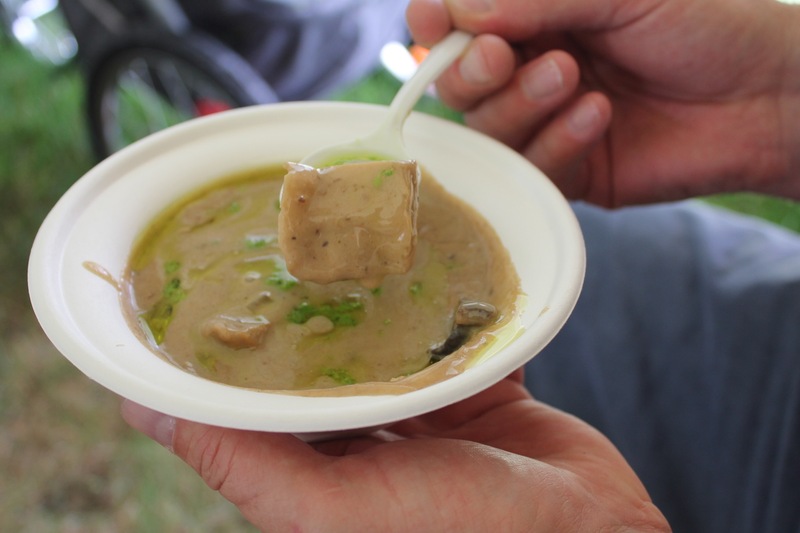 We were also treated to a wild mushroom soup, rich and full of chunks of assorted wild mushrooms and topped with a herb oil. 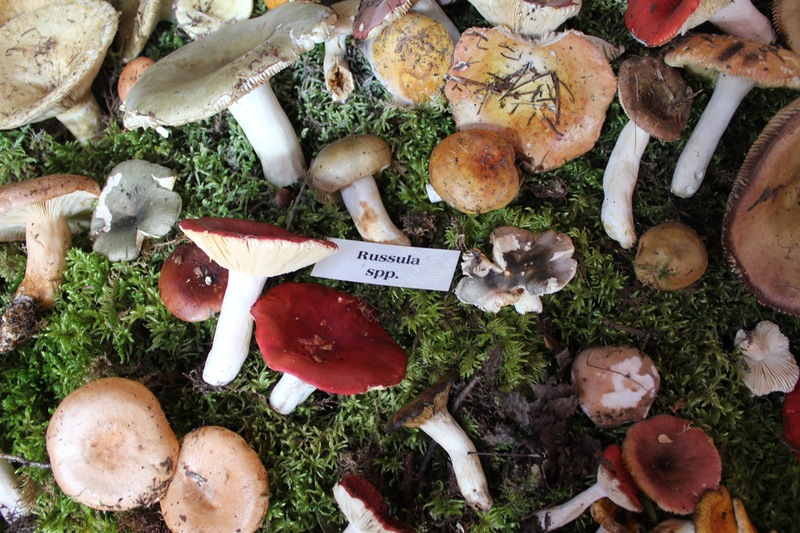 We are so grateful to the Devonian Botanical Garden for their spring, summer and fall mushroom classes, as well as to the Alberta Mycological Society for their many educational events and opportunities throughout the year. You don’t have to be a member to attend some of these events but your annual membership gets you invited to many smaller scale events, talks and forays all over Alberta. 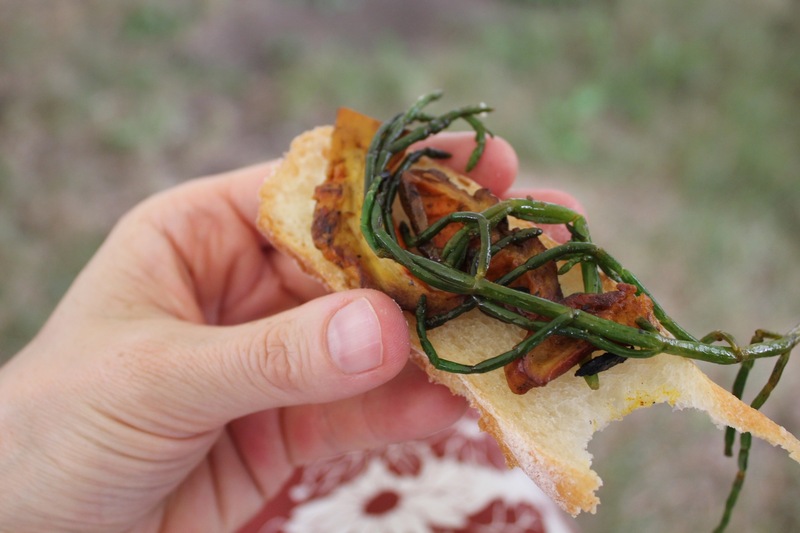 Here you can rub shoulders with, gather and cook wild mushrooms alongside people who are passionate about fungi and have been enjoying mushrooms for years. 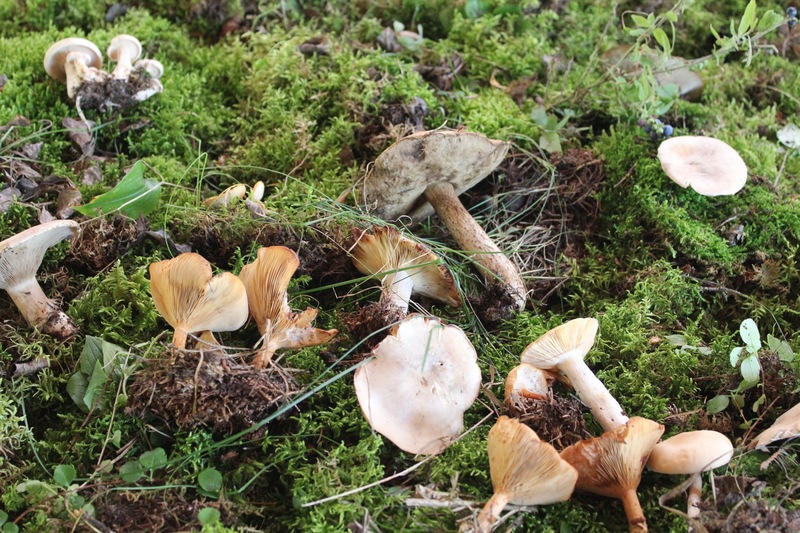 These events often involve a small feast where the mushrooms can be enjoyed together as a group. 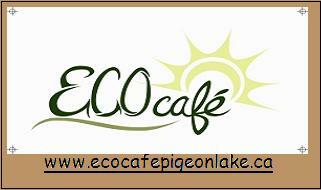 For more information, please click on this link to visit the Devonian Botanical Garden’s website. 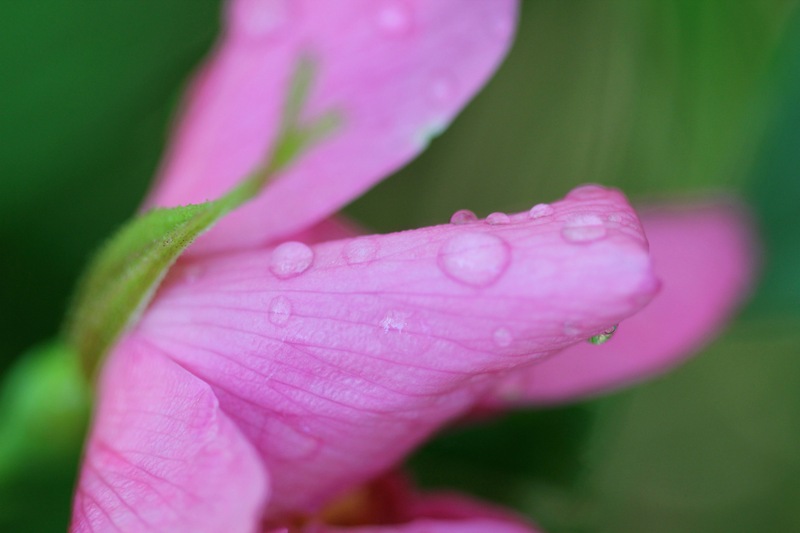 Be sure and check out the Events link to see what other events are lined up at the garden before they close for the season. 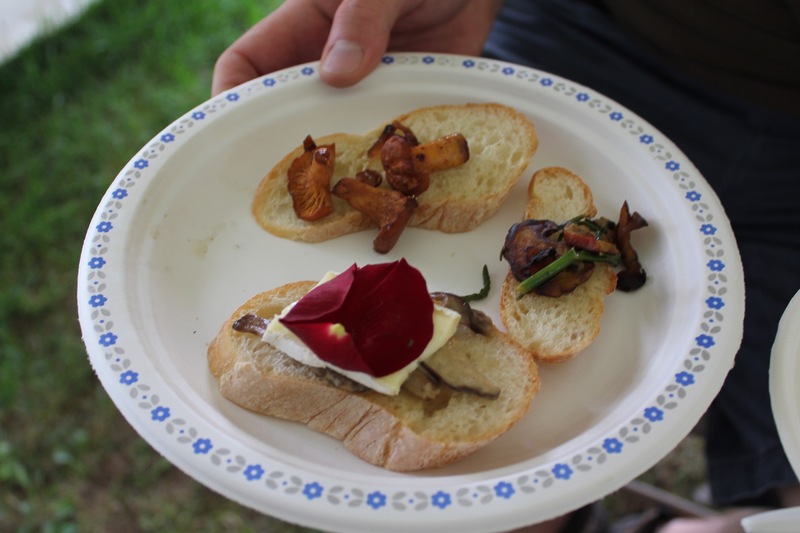 The fall mushroom course is coming up on September 7th. Click here to register. 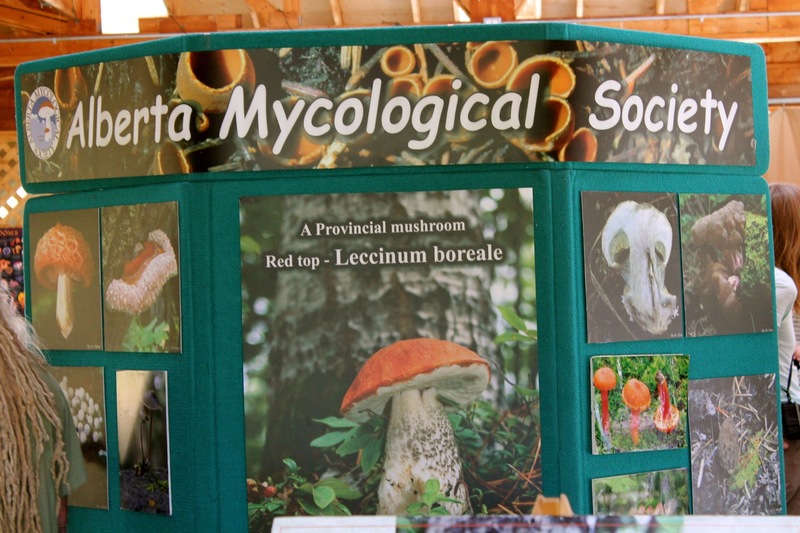 Also, click on this link to visit the Alberta Mycological Society’s webpage for information on memberships, events and a wealth of information provided by the society as well as links to other helpful websites. 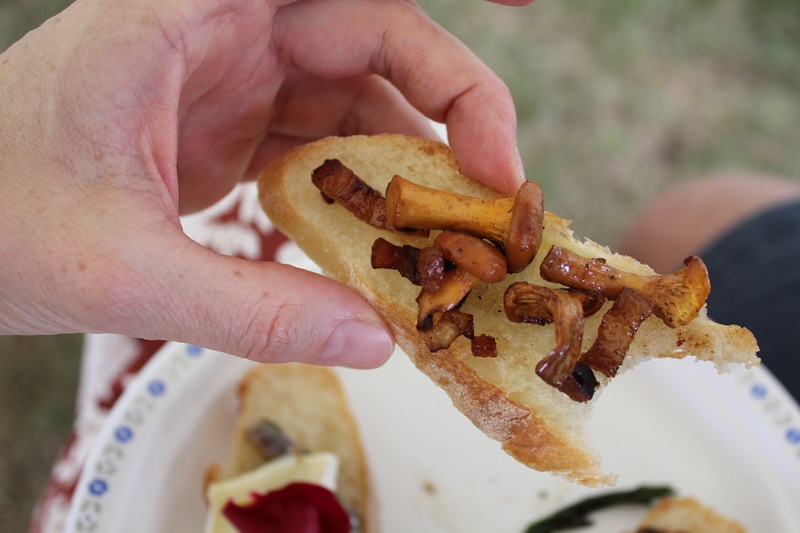 If you’re keen to get in on the action, the Great Alberta Mushroom Foray will take place on August 30th in the Castle Mountain area, SW Alberta. See the website for details. Also, be sure and check out their current exhibit AMS@the Royal Albert Museum until September 15th, 2013. Enjoy your forays and wild mushroom adventures! I have been eyeing some beautiful little puffballs for over a week now and finally took time to do some research on them. After consulting my reference books, field guides and many websites, my confidence was high and I was ready to give them a try. I thought this would be a good mushroom to start with as they are very easy to identify (and you further confirm their identity by slicing them in half and seeing what they look like on the inside). They are considered to be a very safe mushroom. H and I harvested all that we could find on our morning hike, which was only about twelve very small puffballs (just under 1 inch wide). We ended up discarding half of them as they were just turning yellowish, and when sliced in half, were forming stink holes inside and getting a bit soft and pungent. When they are at this softer stage they are actually still edible and even considered a delicacy in Germany, but as this was my first adventure foraging and cooking fresh wild mushrooms, I wasn’t interested! It is probably an acquired taste! The remaining puffballs were nice and firm and had perfect undifferentiated white flesh. Satisfied that I was indeed working with puffballs, I sliced these very thinly, sautéed them in butter and served them over poached eggs at breakfast. They were delicious!!! 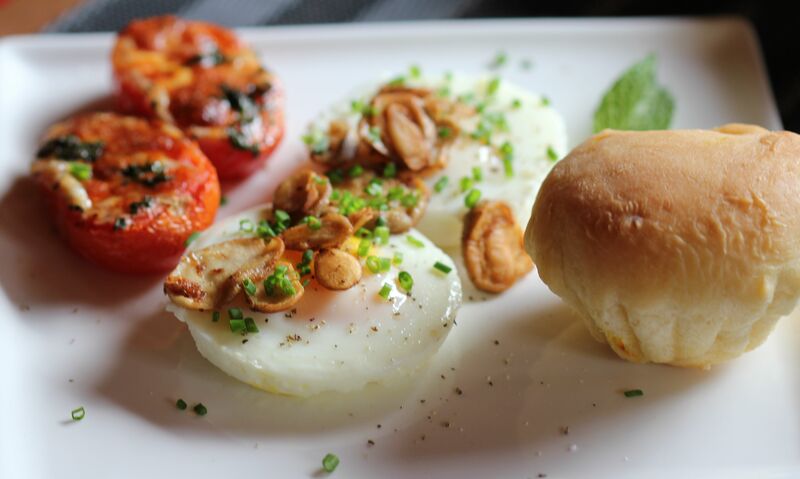 This is our wild mushroom breakfast, served with grilled tomatoes and brioche. Because there was such a small amount of the cooked mushrooms, we ate very slowly, prolonging the experience as much as we could. I don’t think I’ve ever eaten a mushroom this fresh before! Again… delicious!!! According to Schalkwyk (1987), true puffballs are the safest possible mushrooms to identify and eat. They are also known as Common Puffball, Gemmed Puffball, Warted Puffball or Devil’s Snuffbox. 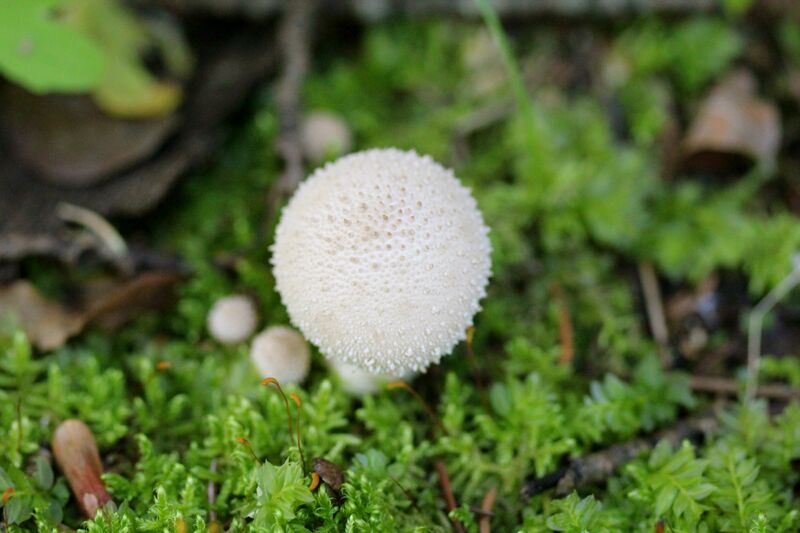 One of the most common puffballs in North America, Lycoperdon perlatum is usually round or pear-shaped and grows both, on its own or in a group. You can find this mushroom from July to October growing on the ground, both in the woods as well as in open areas. Lycoperdon perlatum is edible and choice when young. They can grow up to 3.5 inches across and 4 inches high. 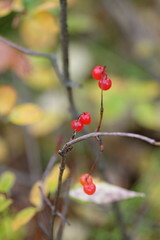 Due to their distinct shape and texture, they are easy to identify and gather for cooking. While young, the flesh is firm, white in color and undifferentiated. 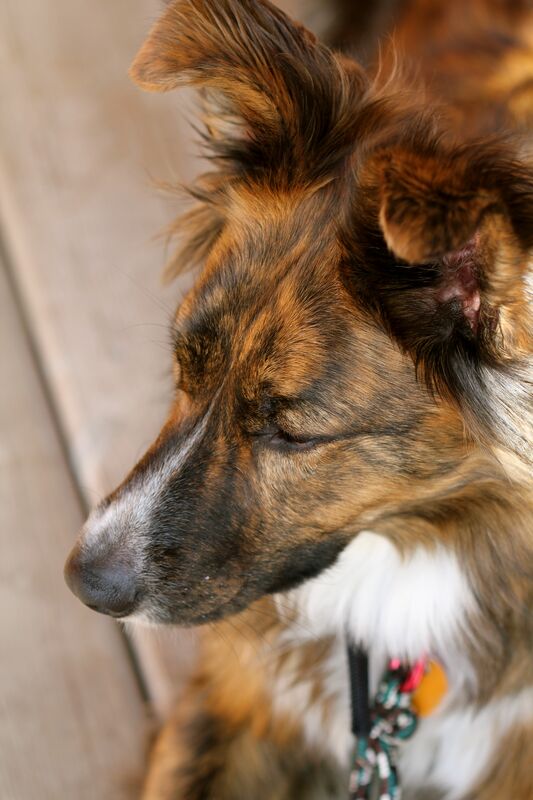 As it ages, the flesh turns yellowish and eventually brown and its firmness is replaced with a powdery texture. The surface is covered with white, gray or brown spines, which fall off as the mushroom matures. Be sure to pick onesthat are white and firm to the touch. Once you get home, confirm your mushroom’s identity by slicing them in half. If the flesh is white and undifferentiated, it is a puffball and safe to eat. If, instead of undifferentiated white flesh you see the shape of an embryonic mushroom, it may be an amanita (in the button stage) and poisonous. Discard! As puffballs mature, a ‘stink hole’ forms. It is called this because it smells like carrion, which inspired the name ‘Devil’s Snuffbox’. 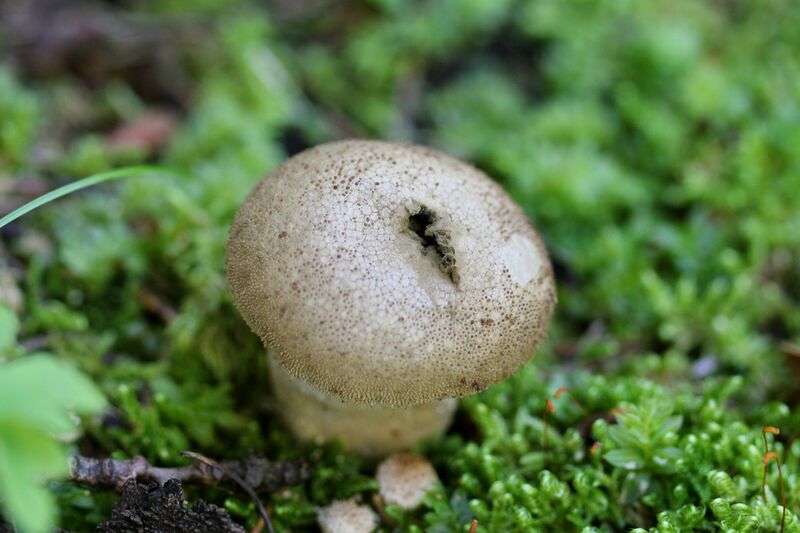 The stink hole leads to a single pore at the top of the mushroom where the spores are released. Brush or peel the mushroom. 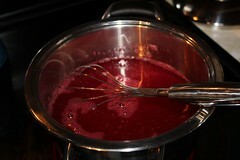 Sauté in butter and add to salads, casseroles, soups, pasta dishes, etc. 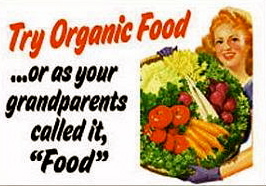 *NEVER eat anything that you are not absolutely sure of the identity of. If, like me, you are just starting out, consider joining your local Mycological Society (i.e. 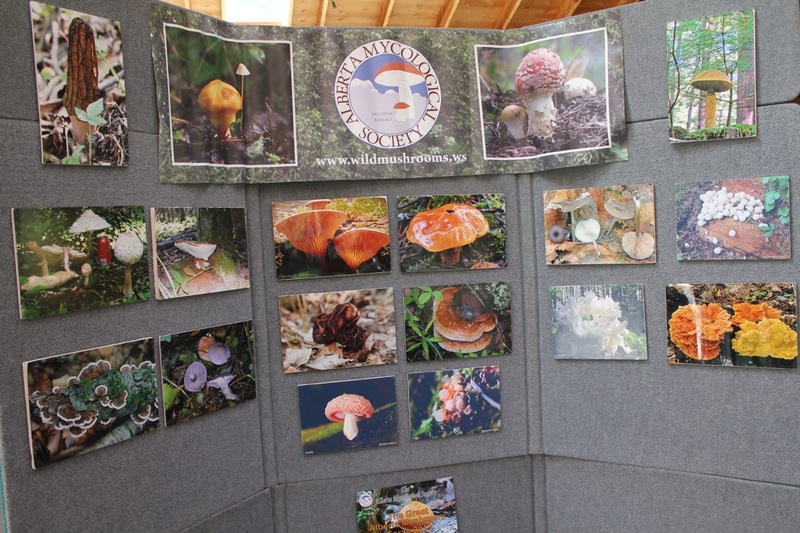 Alberta Mycological Society) and participating in some forays in your local area. Canada. Prairie Deva Press: Edmonton Alberta. Edmonton. Self Published. Edmonton, Alberta.